This recipe is a fan favorite! It’s an excellent source of protein and healthy fats so add a side of carbohydrates to make it balanced and stabilize your blood sugar. Dysphagia Level 1 – Pureed – puree cooked chicken. Puree avocado and salsa and season with taco seasoning. Top chicken with pureed avocado mixture. Omit beans and corn. Dysphagia Level 2 – Ground/Mech Soft – replace chicken breast with ground chicken. Puree avocado and salsa and season with taco seasoning. Use pureed avocado mixture as a sauce with the ground chicken. Omit beans and corn. Dysphagia Level 3 – Soft – make recipe as is. Omit corn. Season chicken with taco seasoning and bake in oven for 20 minutes or until fully cooked. 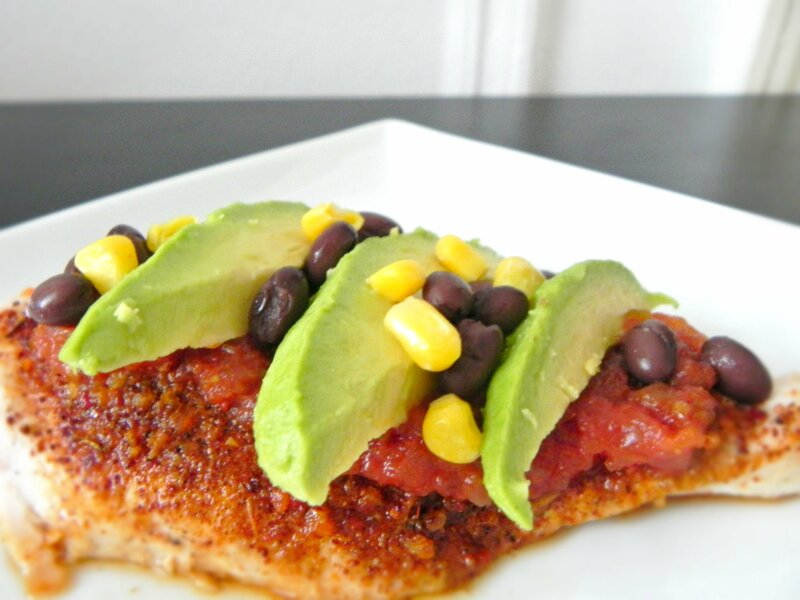 Top each chicken breast with 1 tbsp each of salsa, black beans and corn. Place 2-3 thin slices of avocado on top of each piece of chicken and serve.